With 6 parks located throughout Ontario's most popular vacation regions, there's a Linwood Parks experience for every family. You can view the websites of each park individually. Whether you're looking for a getaway close to home or looking to explore a whole new region, there's always a Linwood Parks property nearby. 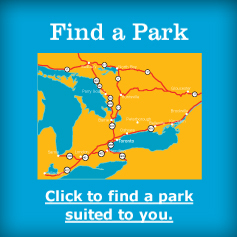 Our parks can be found in popular areas such as the Muskokas, the Niagara Escarpment, the Kawarthas, and Prince Edward County. From boating to hiking or just relaxing on a warm, sandy beach, cherished family memories and moments start at Linwood Parks. This year, refer a friend to a Linwood Park and you'll find yourself closer to a $200 Referral Bonus. For every referral you bring that results in new Seasonal Park Members renting a vacant site, you'll receive a $200 Referral Bonus. It's as simple as sending along their contact information or asking them to mention your contact when they visit the park. When they become successful park members for the season, you'll find yourself in good company, well-rewarded. Our parks are shown below. Each of our parks has its own website where you can view there unique features and amenities. Please click on the seasonal parks below you wish to visit.